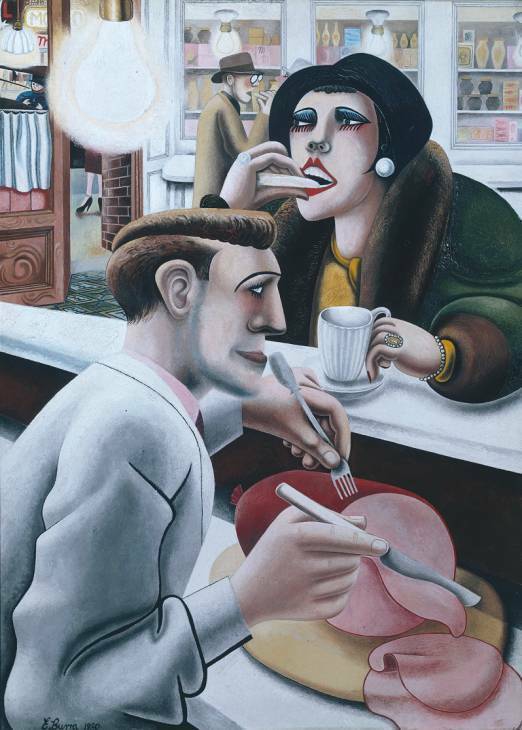 When and Where was Edward Burra Born? 29th March 1905, Elvaston Place, South Kensington, London, England. Edward Burra was the only surviving son of Henry Curteis Burra a barrister and onetime Chairman of East Sussex County Council and his wife Ermentrude Anne (nee Robertson-Luxford). Northaw Place prep school, Potters Bar. (Withdrawn due to ill health). Educated at home instead of going to Eton. Chelsea Polytechnic 1921-23, Royal College of Art 1923-25. 1909: His Sister Anne born. 1914: Burra sent to Northaw Place Preparatory school in Potters Bar, Hertfordshire. 1916: His Sister Elizabeth born. 1917: Suffers from pneumonia and is sent home and continues to be educated at home. 1920: Visits Switzerland with his mother. 1921: Burra takes art lessons with Miss Bradley in Rye. Begins studies in life drawing, illustration and architectural drawing at Chelsea Polytechnic. 1922: Became interested in films whilst at Chelsea Polytechnic and also jazz. He would buy his records at Levy’s in Aldgate. Designs his first poster for the Olympia Horse Show. 1923: Burra moves on to the Royal College of Art. 1924: Redfern Gallery, London exhibit his paintings along with other students from the Royal College. 1925: After leaving the Royal College of Art Burra traveled to Italy with his mother where he contracts rheumatic fever. He recuperates in the city of Bath. He meets Paul Nash during the summer. Visits Paris with his friend the dancer and producer William Chappell in October. Joined the London Film Society with his friend Barbara Ker-Seymer. 1926: Visits his sister Anne in Florence with his family. He was particularly keen on the Botticellis in the Uffizi Gallery. Burra also visits SIenna. 1927: In January Burra visits Paris again and the South of France. Paul Nash who lived near Rye at the time, encourages him to exhibit in the New English Art Club show. In August he is introduced to Oliver Brown of the Leicester Galleries in London. Death of his grandmother Cecile Robertson-Luxford. 1928: His vehicle advertising signs are rejected by the Crawfords. Burra visited Toulon with Chappell and, amongst other people, the writer Anthony Powell. In December he meets Frederick Ashton in Paris. Visits music halls in the Rue de Lappe. Paul Nash offers to teach him woodengraving. 1929: Burra holds his first one-man exhibition at the Leicester Galleries in London. He visits Paris once more in the Spring. Became interested in the works of George Grosz which he had seen in periodicals given to him by Nash. His sister Betsy dies in August of Meningitis. Visits Scotland with his mother in September. In October he exhibits some woodblock prints with the London Group at the Redfern Gallery in London. 1930: Visits France again with Nash and they begin making joint collages. Visits Scotland once more. 1931: Burra introduced to the American poet Conrad Aiken by Nash. He had settled in Rye the previous year and this was the start of a lifelong friendship. Visits Marseilles in February and Paris again in May. Burra exhibits in “Recent Developments in British Painting” in October at Arthur Tooth and Sons Ltd. He designs sets and costumes for Frederick Ashton’s ballet “A Day in a Southern Port” (“Rio Grande”). 1932: Showed some “decorative objects” which were painted trays at the Room and Book Exhibition at the Zwemmer Gallery in May. In June he holds his second one-man exhibition at the Leicester Galleries. Illustrates Humbert Woolf’s “ABC of the Theatre”. 1933: Burra visits Paris again. On his first trip to Spain he travels to Barcelona, Granada and Seville with the writer Malcolm Lowry amongst others. Visits New York, where he stays in Harlem, and Boston in September. Visited the Picasso exhibition at the Wadsworth Atheneum. His work is included in the Art Now exhibition at the Mayor Gallery in London. 1934: In January he returns to the Lower East Side in New York. He exhibits at the “Unit One” exhibition at the Mayor Gallery in London in April. In August he is diagnosed as suffering from pernicious anaemia. 1935: Visits Barcelona and Madrid where he is impressed by the Bosch and Brueghel paintings in the Prado. Returns home in July as his father has been taken ill.
1936: Burra designs sets and costumes for Ninette de Valois’s ballet “Barabau” at Saddlers Wells Theatre. In June he is represented in the International Surrealist Exhibition in London and signs the statement by the English Surrealist Group which appears in the International Surrealist Bulletin No 4. in December he exhibits in “Fantastic Art, Dada, Surrealism” at the Museum of Modern Art, New York. Has to return from Spain early in July as Civil War breaks out. 1937: Stays in Boston with his friends the Aikens and visits the Silver Dollar bar. Returns to England in July. Travels around Cornwall in September. 1938: Burra exhibits in the International Surrealist Exhibition the Gallerie des Beaux Arts in Paris in January. In July he visits Dublin and the West of Ireland. 1939: Visits Milan and Venice with his sister Anne in August. He is included in Contemporary British art at the British Pavilion at the New York World Fair. 1940: Suffers terribly from rheumatism and gout. Spends much of the War years at his home, Springfield, near Rye as travel is difficult. In June he exhibits in the Surrealism Today exhibition at the Zwemmer Gallery. 1942: Visits his sister Anne in Herefordshire. Retrospective exhibition in November at the Redfern Gallery, London. 1943: Begins to suffer from tinnitus and water on the knee. 1944: Burra designs sets and costumes for Robert Helpman’s ballet “Miracle in the Gorbals”. 1945: A book about him is published in the Penguin Modern Painters series by John Rothenstein. 1946: Stayed at Grasmere in the Lake District with his friend the American writer Conrad Aiken. 1947: Burra designs sets and costumes for Bizet’s “Carmen” at the Royal Opera House. In June he holds a one man exhibition at the Leicester Galleries. Visits Dublin and Galway in Ireland with his sister Anne. 1948: In April he visits Cork with Anne. Designs designs for the set of “A Piece of Cake” for the Rank Organisation. Designs sets and costumes for Ashton’s Ballet “Don Juan”. Illustrates Mark Twain’s “The Adventures of Huckleberry Finn”, Edgar Allen Poe’s “Tell Tale Heart” and Laurie Lee’s “The Voyage of Magellan”. 1949: Burra holds a one man exhibition at the Leicester Galleries, London in July. 1950: Designs sets and costumes for De Valois’s ballet “Don Quixote”. Tours France with Anne. 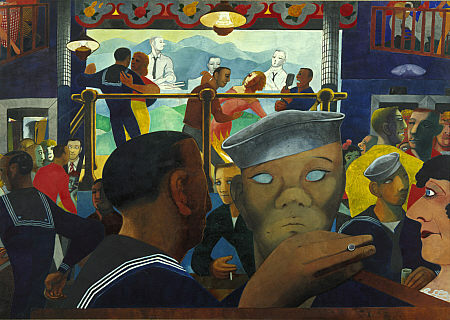 1951: Included in the Art’s Council Festival of Britain exhibition “Sixty Paintings for 51”. Designs sets and costumes for David Paltenghi’s “Canterbury Prologue” produced by Ballet Rambert. 1952: First exhibition at the Lefevre Gallery in London. Visits Paris and Barcelona. 1953: Stays with the Aikens at Brewater, Massachusetts in America from April until October. The Burra family leave Springfield for Chapel House in the middle of Rye which had been built for them. 1954: Burra is taken into hospital for a blood transfusion. Visits Paris in July for a jazz festival with Barbara Ker-Seymer. 1955: In January he holds a one man retrospective at the Magdalene Sothmann Gallery in Amsterdam. In April has another one man show at the Lefevre Galleries. Visits New York and Boston where he paints the “Silver Dollar Bar”. Holds a one man show in Boston. 1956: Burra suffers an attack of anaemia. Holds one man exhibition at the Museum of Art, Rhode Island School of Design. 1957: Begins being more interested in botanical subjects and holds an exhibition of still lives and flowers at the Lefevre Gallery. He is included in the Critic’s Choice 1957 by Neville Wallis. His father dies in December. 1958: Designs sets for the Adelphi Theatre’s production of “Simply Heavenly”. 1959: Burra suffers from mumps and anaemia. Visits Paris and has a one man exhibition at the Lefevre Gallery in November. Included in Three Contemporary English Artists at the Whitworth Gallery in Manchester. 1961: Visits Paris with the photographer Barbara Ker-Seymer and has a one man exhibition at the Lefevre Gallery in July. 1962: Last visit to Ireland. Takes day trips to Boulougne. Visits the Francis Bacon Exhibition at the Tate Gallery. Visits Ely with his sister Anne. 1963: Burra refuses an A.R.A offered by the Royal Academy of Arts. Holds a one man exhibition in April at the Lefevre Gallery. 1964: First visit to Holland with his sister Anne. Meets Francis Bacon via his friend John Banting and they begin to drink together in the Colony Club in Soho. 1965: Burra visits Norwich with his sister and is impressed by the John Sell Cotman paintings. Visits Cambridge and visits the Fitzwilliam Museum. One man exhibition at the Lefevre Gallery in May. Visits Florence in August. Worked on some pictures for the Oxford Illustrated Bible. 1966: Visits Lincoln, Boston and Kings Lynn with Anne and in September revisits friends in Florence. 1967: Visits Peterborough, Norwich and the North Norfolk coast with his sister in April. Has a one man exhibition at the Lefevre Galleries in May. Visits Harrogate in June and August. Wins the Marzotto prize. He is impressed by the Young Contemporaries Exhibition at the Tate Gallery, particularly David Hockney. 1968: Burra visits the Wye Valley and the Welsh borders in March. Death of his Mother in May. 1969: Moves from Chapel House to 2 Springfield Cottages, a gardener’s cottage next to his former home, Springfield at Playden, near Rye. Visits Rochester, the Peak District, Bath and Salisbury. One man exhibition at the Lefevre Galleries in April. 1970: Burra visits dieppe in January and Norwich with his sister in May and they spend August in Penzance, Cornwall. 1971: Visits Bath and then on to the South Wales Valleys. Shows new work at the Lefevre Gallery and early woodcuts at the Treadwell Gallery in London. In June he is awarded a C.B.E. in the Birthday Honours list. Visits Liverpool and Snowdonia in October. Starts his first etchings. 1972: Visits North Yorkshire and Northumberland with his sister Anne. 1973: Burra visits the Lake District with his sister Anne in April. In May The Tate Gallery holds an Edward Burra Retrospective of 143 of his pictures and there is a show at the same time at the Lefevre Galleries showing new work. In June and July he travels to Boston, Lincolnshire with Anne and also Cambridge. In September they visit Tavistock and Dartmoor. 1974: In May he visits North Yorkshire with his sister and then they go on to Northumberland, seeing Lindisfarne and Warkworth Castle. They then visit the Cairngorms in Scotland. Breaks his hip during the year from which he never fully recovered. 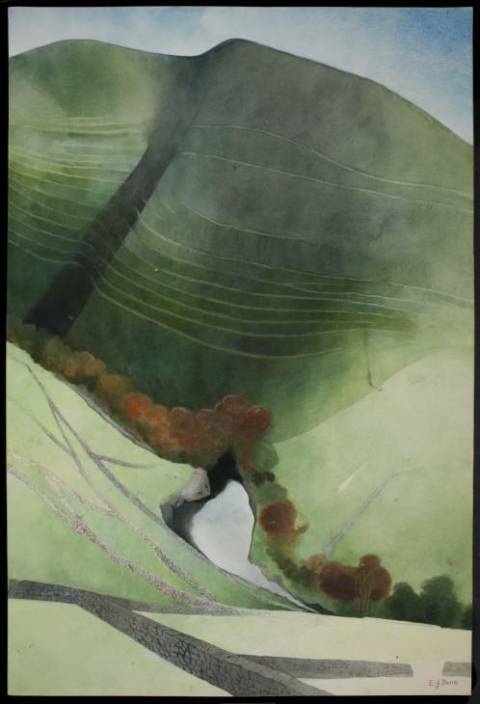 1975: Burra visits Canterbury with Barbara Ker-Seymer, He visits Cornwall with Anne in April and shows new work at the Lefevre Galleries in May. 1976: Has a bout of gastric flu in February and falls over again in Rye in May this time breaking his leg. In September he is admitted to Hastings hospital with a blocked bowel and never leaves. 22nd October 1976, Hastings Hospital, England. Rye Cemetery, Rye, East Sussex. 2 Springfield Cottages, Playden, Rye. (former home where he met the artist Laura Knight).